Incredible Ways To Add Balloons In An Indian Wedding Occasion. Indian Wedding Occasions are one of the most cherished occasions that equally excites the wedding couples and the guests. The Bouquets of flowers, gifts, amazing dresses, and many other things are directly or indirectly related to the Indian Wedding. When it comes to decorating your special day, balloon decoration will take place lead over the different ways of Indian Wedding decorations. Give your guests a warm welcome by decorating the entrance area with colorful balloons. You can create an impressive arch and place it at the entry so that your guest can enter through the arc gate created by you. The main stage where the couple will sit and complete some rituals should be decorated with a beautiful colorful backdrop. Your guests should get a chance to click amazing pictures in front of the backdrop created by you. Decorate each table of your guests with a centerpiece that will also contain the name of the guests sitting there. You can add names by asking decorator to engrave guests’ name before the balloon is inflated. This type of centerpiece decoration will not only make your guests feel special but will also make their day memorable. Create colorful corners out of colorful balloons and place them at the attractive places like at the corner, at the center of the stage, near the guests’ table, or any other place where you think it can easily grab the attention. 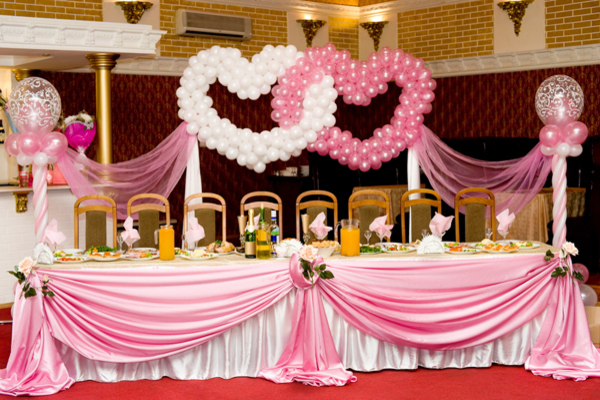 If you are organizing your wedding function at night, try to decorate the place with as many balloons as you can. You can use glowing sticks and insert them inside the balloon so that your balloons glow at night. If your event is in daytime, you can ask decorators to illuminate the darker area of your venue. This will help you to throw an Indian royal wedding without spending lots of your money. You can save your money and give a grand Indian wedding party to your guests. All of the above ideas work well to throw a fabulous party to your guests. This one, the sixth one is again one of the best ideas that will leave your guests stunned. You can decorate the ceiling of your wedding venue using helium-gas filled balloons so that they can easily touch the ceiling area without any hassle. Use colorful and glowing balloons to create a mesmerizing impact. Above are some of the smart yet incredible ways to add balloons to an Indian wedding occasion. Hopefully, you found this information useful and consider implementing these ideas to make your Indian wedding event, a grand success.